Welcome to The Maven Store, stock up on back issues and check out the CD's and vinyl that The Maven has acquired to sell on with all profits going to subsidise the fanzine and tour flyers etc. The most recent and best issue featuring album reviews of 'Uninvited Like The Clouds', 'Beside Yourself', 'El Momento Descuidado' and 'Back With Two Beasts' plus part two of the mammoth interview with Marty. Featuring the first part of the Marty Willson-Piper interview, reviews of the European tour, the Forget Yourself album, Isidore, a look at Marty's archive recordings in 'The Church Vaults' and a speculative feature on potential singles that were not released. Featuring reviews of Parallel Universe, Peter's Simple Intent, Noctorums debut and Steve's Freaky Conclusions. 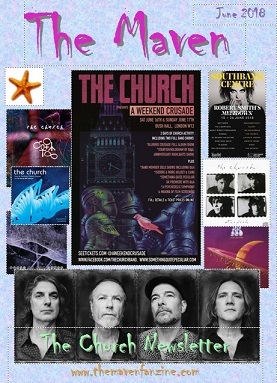 Serving as a preview and accompaniment to the events of the weekend crusade featuring reviews of Psychedelic Symphony, Starfish, Blurred Crusade, Tyg's In Spave, Peter Koppes' Misty Heights Compilation and much more. Please note:- All copies of fanzines are 'new', some may however show signs of wear as they've travelled around Europe on the merch stall. I will always endeavour to send you the best condition copy I can find, generally it's just light scratching on the colour cover.